Warner Bros. launched its DC Extended Universe (DCEU) in March with Batman v Superman: Dawn of Justice, which wasn't terribly well-received by fans and critics alike, but it did fare well at the box office. The movie has taken in $328.1 million domestically and $870.2 million worldwide since its release in March, but many fans are already looking ahead to the next installment in this DC movie universe, Suicide Squad, which is set to hit theaters on August 5. As it turns out, a group of lucky fans had the chance to see the movie in its first ever test screening, and the social media reactions were overwhelmingly positive. According to a number of Twitter users, Warner Bros. held the screening Thursday night at Union City, California's Century 25 Union City and XD theater. While the tweets we've assembled may not represent the opinions of the entire audience in that test screening, these fans had nothing but positive things to say about the superhero adventure. One fan called Margot Robbie the "perfect Harley Quinn," while others proclaimed that Will Smith was "amazing" as Deadshot. One fan even teased part of the ending, which apparently includes a humorous scene with Killer Croc (Adewale Akinnuoye-Agbaje). It's worth noting that Suicide Squad recently underwent massive reshoots, which were conducted to reportedly add more heart and humor to this movie. Both trailers for Suicide Squad have already been very well-received by fans and critics alike, and there have even been reports that Warner Bros. is already developing Suicide Squad 2, which may start shooting in early 2017 and be R-rated. After the success of 20th Century Fox's Deadpool, many fans had hoped that Suicide Squad would aim for an R rating, but it has been confirmed that it will be PG-13. Suicide Squad features a massive ensemble cast including Will Smith (Deadshot), Margot Robbie (Harley Quinn), Jai Courtney (Boomerang), Joel Kinnaman (Rick Flagg), Cara Delevingne (Enchantress), Viola Davis (Amanda Waller), Adewale Akinnuoye-Agbaje (Killer Croc), and Jay Hernandez (El Diablo). Scott Eastwood and Ray Olubowale also appear in the movie, but their characters have not been revealed. One of these new photos features the whole squad together, while the other features Deadshot, Rick Flagg and Killer Croc. Ben Affleck will also reprise his role as Batman from Batman v Superman: Dawn of Justice. The supporting cast includes Ike Barinholtz, Alex Meraz, Jim Parrack and Common. While none of their characters have been confirmed yet, there was a rumor last summer that claimed Scott Eastwood is playing Deathstroke, while Common is reportedly playing the DC Comics character Abel Tarrant, a.k.a. The Tattooed Man. Suicide Squad will be going up against The Weinstein Company's drama The Founder and EuropaCorp's comedy Nine Lives on August 5, and it is shaping up to be one of the last box office blockbusters of the summer season. 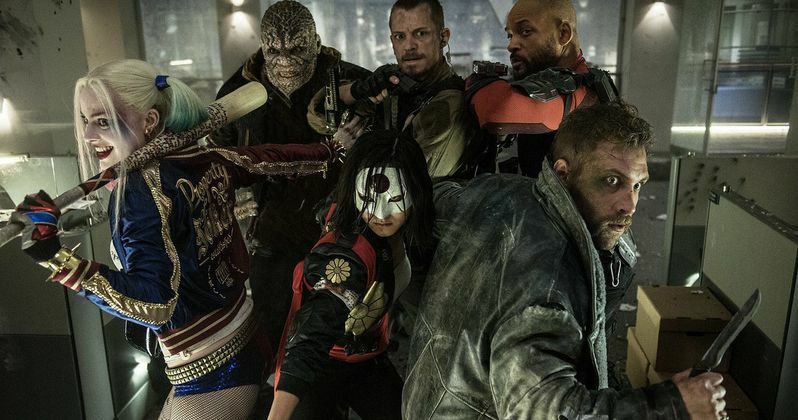 Take a look at these tweets below with fans offering plenty of praise for Suicide Squad.